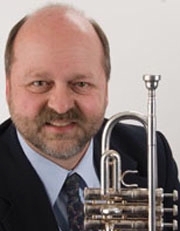 A former member of the San Diego Symphony Orchestra and principal trumpet in both the San Diego Opera and San Diego Chamber Orchestras, Alan Siebert has performed and recorded with Summit Brass and taught at the Keystone Brass Institute. He was principal trumpet with the American Sinfonietta, the resident orchestra for the Bellingham Music Festival. Hornpipes, his solo album was released on Integra and he co-authored Teaching Brass: A Resource Manual, published by McGraw-Hill. He has recorded with Pro Arte, Integra, New World, Discovery, Klavier and Summit Records. On the board of directors for the International Trumpet Guild, he is also a member of the Carillon Brass and the Dayton Philharmonic Orchestra. His teachers include David Hickman, Charles Schlueter, John Ware, Clifford Lillya and William Dederer. Learn more about CCM's Trumpet Studio by visiting ccm.uc.edu/trumpet. MM, University of Michigan, Ann Arbor, MI. DMA Studies, Arizona State University, Tempe, AZ.